Outside my window, a man running. isn’t a skidding car or cancer. worry washes off him with his sweat. sure ease of a country they call Health. and on which we’ve run ever since. Vor meinem Fenster, ein Mann, der rennt. wäre nicht Krebs oder ein Auto außer Kontrolle. Wohlsein eines Lands genannt Gesundheit. auf der wir seither nichts anderes als rennen. 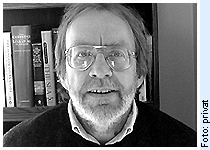 PETER FILKINS is the author of two books of poems, “What She Knew” (1998) and “After Homer” (2002). The recipient of a Berlin Prize Fellowship in 2005 from The American Academy in Berlin, he is also the translator of Ingeborg Bachmann’s collected poems, “Darkness Spoken’”(2005), as well as her novels, “The Book of Franza” and “Requiem for Fanny Goldmann” (1999). He has been awarded fellowships from the Massachusetts Cultural Council, Yaddo, MacDowell, and the Millay Colony for the Arts. Previously he was also the recipient of a Fulbright grant to Austria and an Outstanding Translation Award from the American Literary Translators Association. His work has appeared in numerous publications, including The New York Times Book Review, Poetry, Partisan Review, The New Republic, The American Scholar, and the Los Angeles Times Book Review. Filkins teaches writing and literature at Simon’s Rock College in Great Barrington, Massachusetts.